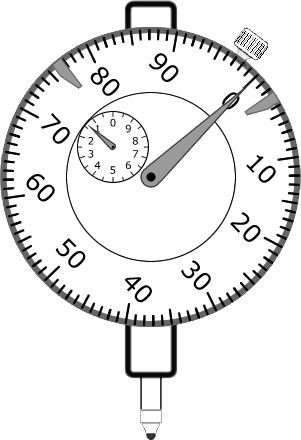 The Dial Indicator, some times called Prob Indicator, it is one of the few analog measurement instruments that allows the measurement of linear measurements directly (by measuring directly the desired) or indirectly (establishing the difference between the desired measurement and another known). 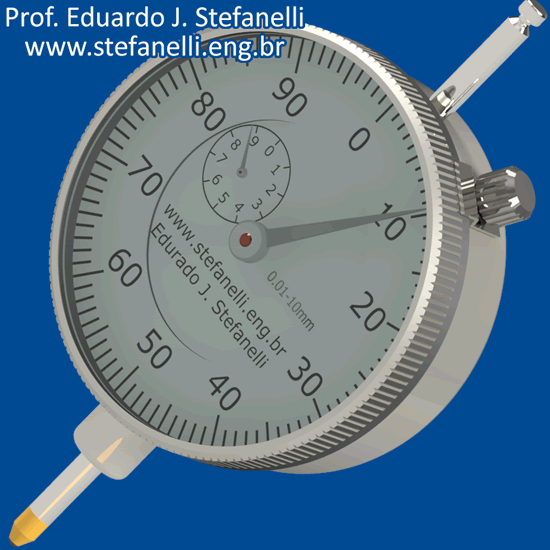 In this simulation you will learn the science of using this measuring instrument, interacting with the spindle or the contact tip ( see main components). In this learning object, you can also turn the ‘display’ (dragging and dropping the hoop in a circular motion) so that the line ‘zero’ align with the pointer after the called ‘ preload ‘, hide the measure provided (by clicking the eye icon) and cancel the spring effect of the instrument (by clicking the ‘lock’). This measuring instrument operates affixed to devices such as bases, supports, performances or guides. Due to its fragility, its use in the operator’s hand is discouraged. By definition, direct measurement (or indicator) occurs when the value of the wished measurement (mensuring it) is read directly in the device display of the measurement instrument. For example, when we determine a linear dimension with a paquimeter ( see the paquimeter simulator ), the reading that we obtained in the scale and it’s vernier , not considering errors, is the efective measure of the object that we are submiting to measurement. 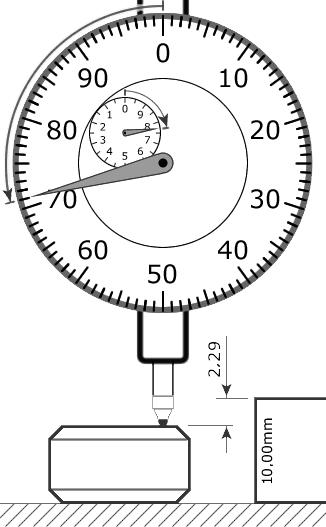 We use this dial indicator on this mode of measurement together with surface plate and(or) supports to measure the thick plates, for example, among other measures relatively small. This method of utilization is seen in the Simulator and on figure 1. We submitted the instrument to a preload , set to zero mark (turning the counter), we moved the spindle manually giving space to put the object to be measured in the axis of the instrument and return the spindle until the contact with the part that holds it. The dimension is read directly in the counter, by relative position (displacement) of the main pointer and of the turns counter. On this case, by contrast, we have indirect measurement (indicator), when the read value in the display device of the instrument it is not the value of the measure that we are measuring. For example: when we use a barometer, or we measure the shadow, to determine the height of a building. One of the possible uses of the dial clock compartator is to calculate the difference between a pattern and the one of we are measuring. We zero the instrument with a standard whose dimension we know and establish the difference between it and that of the object we are subjecting to measurement, algebraically-Figure 2. A full turn of our simulator’s main pointer represents the equivalent of one millimeter of spindle motion. Its dial has ten divisions numbered (from 0 to 90 from ten in ten) and each of them is subdivided by ten, making a hundred (100) divisions. In this way, each of the marks on the display equals one-hundredth of the millimeter (0.01mm) -figure 1. The nominal range of the instrument of Figures 1 and 2 is 10mm (to circumvent the limitations imposed by the resolution of the monitors, the nominal range Of this Comparator Clock Simulator is 1.14mm – Click here and interact with a realistic comparator clock simulator with a realistic 10mm nominal range); This feature makes it necessary for some device to count the number of turns of the main pointer (number of whole millimeters to be added to the centesimal part). The instrument is fixed in a place that works in conjunct with a surface plate. Touch the contact point to the surface plate and apply the preload. Turn the display until the mark with the zero (0) mark is aligned with the pointer. Read the initial condition of the pointers, comparing with the display. Gently, raise the spindle until you find space for the object of measurement. With the same care, return the spindle (propelled by a spring) until it touches the object of the measurement. Read the pointer of the turn counter (small display), subtracting the number of spaces between the marks that it runned into. See that the pointer was perfectly aligned with zero at the beggining and later passed the seventh line. That means that there is a centesimal part to be read. Read the main pointer to determine the centesimals. 7mm + 0.71mm = 7.71mm, that is the dimension of teh object that is being measured. The instrument is fixed in a place that works in conjunction with a surface plate. Touch the contact point in the surface plate and set the preload. Turn the display until the mark with the zero (0) mark aligns with the pointer. Read the initial condition of the pointers. Take off the pattern and put in the object for measurement. With the same care, return the spindle until it touches the object of the measurement. Read the pointer of the turning counter, subtracting the number of spaces between the ones that passed through. Subtract this result from the value of the measured dimension of the pattern (the direction of rotation of the (counterrotating) pointers indicates that the object is smaller than the standard. Once the preload has been established, the dial indicator has a ring that allows you to rotate the dial to, for example, align the zero with the Main Pointer for easier reading, for this you should loosen the Ring Fixing Screw. 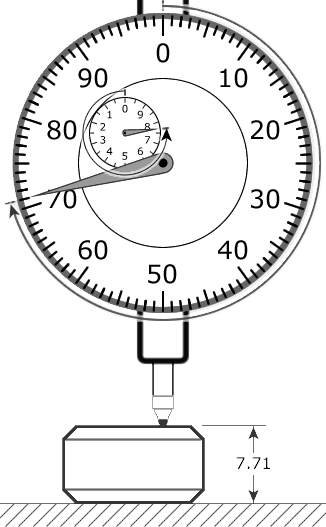 Click here to explore a image of a dial indicator and know the name of its main components.